This flag, which is in the Sofia War Museum, was used in the 19th Century by Bulgarians fighting for independence from the Ottoman Empire. The inscription means "Freedom or Death!". 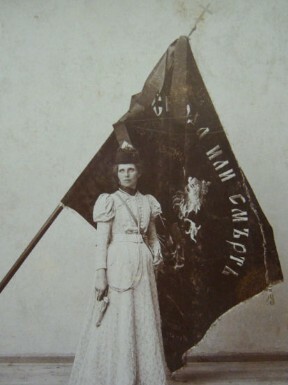 Postcard of Raina Popgeorgieva Futekov-Dipcheva, better known as Princess Raina, who was a Bulgarian teacher, embroidered flag of the main rebel Revolutionary Panagyurski County for the April uprising. On the day of the announcement of the uprising she flies alongside Benkovski. The photo was made in 1901 in Sofia on the occasion of the first official celebration of the April Uprising, right after Rayna Knyaginya embroidered the flag. The flag is accurate replica of the original "chief flag" of the 4th Panagyurishte Revolutionary District embroidered by the same person - Rayna PopGeorgieva Futekova (called Knyaginya, Princess) and flied during the 1876 April Uprising. The flag was captured by Ottoman forces, and probably has been burnt in a fire in Haskovo City Hall during the 1877-78 Russo-Turkish War. The embroidering of the replica has been financed by "April 20th" Committee. It has been brought out during the anniversaries of the Liberation and the Uprising. Until 1950, when the flag was displayed in the House of Rayna Knyaginya Museum, it has been kept consecutively by Pavel Koychev, a Panagyurishte veteran from the Uprising, Ivan Kuzmov, chairman of the Panagyurishte Veteran-Volunteer Association, and the Panagyurishte Cultural House.